Friends of El Dorado County has been investigating impact fee overcharging complaints from members of the community. Primary research was performed on the El Dorado County school districts and the El Dorado County Department of Transportation. Our findings were brought to the attention of our Board of Supervisors, El Dorado County Office of Education, and county staff to allow them the opportunity to make repairs before we went public. El Dorado County student populations are generally down over the past ten years. Most districts continue to collect growth mitigation fees while student populations are declining. For example, Buckeye School District had about 744 residential units built in the last seven years but lost 15 students in that time period. Lake Tahoe Unified has lost almost 2,000 students since 2001. Impact fees are justified when a district can show new development will cause a need to provide housing for students or new students will cause a need for modernization. Many districts have lost hundreds of students, yet they forecast growth in justification reports to collect millions of dollars in fees. We see available capacity in the school justification reports. However, most reports distort EDC student yields by using metropolitan forecast studies while neglecting to mention the reality of years of student population decline. Consultants use regulations for state grants instead of the guidelines in the government code 65995.5(a) for impact fee justification studies. The downtrend in student populations started well before the economic downturn and is spread throughout most El Dorado County school districts (California Basic Educational Data System- CBEDS, see colored graph). The CBEDS graph below demonstrates student populations from 2001. Building permit totals compared to CBEDS per district do not support the justification study’s student yield rates from dwelling units. For example, Buckeye has a negative .02 student yield rate per home. The district lost 15 students in seven years while 744 homes were built (See school map data). This substantive and critical demographic information is left out of the justification reports. Every district with 5 year declining populations has negative student yields from homes. 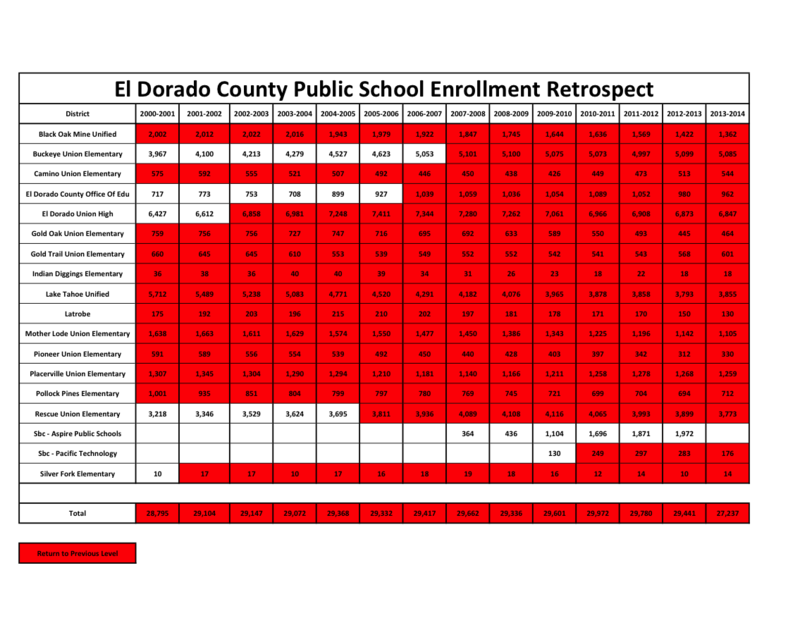 The graph below shows the number of single-family units built in each district by year. Source – El Dorado County G.I.S. Impact fees and their studies are regulated by the government code. The government code 65995.5(a) is clear that local demographic, planning department, and local historical information is to be used in the justification reports. 65995.5(a) The school facilities needs analysis required by paragraph (2) of subdivision (b) of Section 65995.5 shall be conducted by the governing board of a school district to determine the need for new school facilities for unhoused pupils that are attributable to projected enrollment growth from the development of new residential units over the next five years. The school facilities needs analysis shall project the number of unhoused elementary, middle, and high school pupils generated by new residential units, in each category of pupils enrolled in the district. This projection of unhoused pupils shall be based on the historical student generation rates of new residential units constructed during the previous five years that are of a similar type of unit to those anticipated to be constructed either in the school district or the city or county in which the school district is located, and relevant planning agency information, such as multiphased development projects, that may modify the historical figures. Lake Tahoe Unified has lost 1,857 students since 2001 and still collects growth mitigation fees. The funds from the impact fee account. If schools are not impacted then no impact fees are required. We will contend with the offending school districts who continue to collect illegal fees. Gov. code 65978-If overcrowding conditions no longer exist, the city or county shall cease levying any fee or requiring the dedication of any land pursuant to this chapter.